We’ve been talking about theme this month and I wanted to conclude this month with some questions on how we can evaluate the success of a theme. Matt talked a little bit about how much theme is actually present; let’s look at how we can evaluate the strength of the theme in execution. In this case we’re not necessarily looking to create the “dripping with theme” mindset where we cram as much theme as possible in a game. We’re looking to maximize the benefit of a given theme to the overall experience. Let’s take a look at some basic contributing elements of theme. What can sell a theme to your audience? More than anything else visuals and tangibles can be the most convincing elements of theme. If all a player observes on the box, cards, board and components are thematically appropriate illustrations you’re off to a great start. If you’re going to have a Star Wars game about space battles it certainly helps to have X-Wing miniatures to move around the tabletop. My favorite reward for playing a thematic game are the “oh cool, look at that” observations present in names, locations, events, actions and objectives. In a historical context a game like Twilight Struggle succeeds naturally by using prominent Cold War events on cards in the ongoing tension of the game. A game using Lord of the Rings probably needs to represent the essential locations of Middle Earth. Including subtle references and details for dedicated fans of a subject matter can really reward your core audience. These will be the players shouting from the rooftops if you execute it well. [Editor’s Note: The remainder of this article uses a slightly modified style of writing we wouldn’t ordinarily use to discuss game design. The intent was to use references, odd comparisons and a bit of humor to demonstrate an esoteric environment of confusion a new player may experience with an unfamiliar theme. Themeception. The easier a theme is to explain to new players, the wider the potential audience. This is a natural factor that raises concerns about ostracizing or eliminating the interest of potential players. One success factor comes from understanding how much theme-specific information must be explained to a new player in order to participate. Battlestar Galactica seems to walk the line successfully by being accessible and inclusive to a thematically unconcerned player while not disappointing the familiar fan base. This is particularly interesting as a franchise such as BSG would ordinarily be highly restricted with its audience; someone who is unfamiliar with the BSG franchise won’t bother with the game. But because the ideal player count (the upper end of three to six players) and it requires a notable time investment (3-4 hours) it is in a tough position of retaining utility without disappointing existing fans. A delicate tight rope walk indeed. On the other side of the table some games go above and beyond to sell the theme to its core audience. A potential downside of appealing to an “in-crowd” is that these attributes not only can be lost on a different audience but also become confusing and detract from the experience for anyone who just wants to join in with friends without having to catch up on the last half century of Doctor Who. Matt wrote about meeting player expectations with theme earlier this month and framing those expectations appropriately can have a lasting impact on your success. If you use Las Vegas as a thematic background for building casinos or controlling the Vegas strip it would make sense for the game to have a bit of gamble to it; some risk-taking to fulfill the spirit of the city. Robinson Crusoe demonstrates a faithful representation of the tension of survival under dire circumstances. Theme is a bit like setting the table in preparation for a meal, players get a loose feel for what is about to happen. If you were traveling to attend a wedding you’re probably going to expect music and festivities. So it can be appropriate for a sore subject like kingmaking scenarios to show up in The Game of Thrones board game. It is fitting for players to be forced to takes sides throughout the game and even better when a narrative of the books can emerge at the very end of the game to determine the winner. 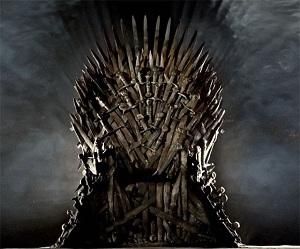 Thematic subtleties like backstabbing and kingmaking can make the entire GOT experience by showing up at a table full of angry players to send their regards. How quickly can players understand the theme after you place your game in front of them? This is interpretation of the designer’s vision. Is the game explained through artwork, mechanics, language, and/or objective? The success factor here is ensuring the theme can’t be easily mistaken with similar subject matter. If a publisher were to insert the Aztec sun stone into a game theme using Mayan culture, would anyone really notice or is the game really about Mayan culture at all? Theme doesn’t have to be the priority in a game but it can lead to an impressive level of criticism if it misleads players. A shallow effort to execute theme is one of the first comments you’ll see in a review if the game name and cover scream “thematic” while the game play screams “melodramatic”. This distance between designer intent and player experience is perhaps the best explanation of how you or I can come away from a completed design feeling a strong theme and a new player comes away with the opposite perspective. Theme can often be confined to a rulebook with rich text descriptions and historical context for mechanics – all of which is frequently lost when a game is retaught to a new audience who may never open the rulebook. Your audience never saw your late night design breakthroughs and you can’t be there to explain your thematic basis for every object in the game. How can you bring the key elements of theme out to every player who experiences the game? Think about the one biggest object in your game design that defines the theme. Is it the board? A centerpiece component? A detailed set of icons? Now take it away. How much of your theme still remains? Consistency is an underrated attribute and the best games don’t rely on the “one big idea” to instill a sense of theme. A perfectly ordinary law-abiding citizen playing Flash Point: Fire Rescue would find it difficult to interpret as anything other than a game about an unsuccessful arsonist. Contributing elements of theme should combine to become greater than the sum of the parts. Well, sort of. That is a just a meaningless cliche which is about as helpful as telling game designers “This game could have benefited from including a fireman’s pole”. Question 637: In what episode did Doctor Who use a fireman’s pole? The reality of a theme in game design is that it creates a constraint with your design decitions. The most exciting part of a new design is the imaginative freedom which is only limited by our individual abilities. The second most exciting part is that when we inevitably add a zombie theme we lose a great deal of that freedom. We lose part of our creative interpretation and are pressed adhere to a genre. Unfortunately thematic constraints can mean your design loses a little bit of its soul. Or all of its soul if in fact your theme is actually Zombies. Given the restrictive expectations raised by themes we have always seen a presence of the most open-ended themes available: fantasy and sci-fi. It’s only natural that some designs gravitate toward fantasy or sci-fi in order to be absolved of thematic obstructions. Since these themes can used to justify nearly any backstory, mechanics or objective they should have a higher standard in development of thematic elements. One final area we considered writing about this past month was the popularity of various themes. Why Zombies? Why trading on the Mediterranean? These themes are successful because they are easy to deliver on player expectations and they are a reasonable basis for plenty of mechanics and objectives. Zombies are a familiar theme – you know what you’re getting into and they are a comfortable foe. They are a mindless enemy that unites humanity around the table for skull crushing fun for a few hours too many. Trading in the Mediterranean has very simple ingredients to fill a thematic void. Can we get some ships and a map of Southern Europe? Done. Now we’ve got a surprisingly clean canvas to work on. You can back the mechanics into it almost as easily. Low requirements for theme can be a valuable foundation if theme was never a primary concern. Despite my propensity to poke fun at various themes in this article, the most important takeaway is that we shouldn’t let the existing frequency of a theme determine our tendency to use. People will always critique common themes but great games always rise to the top, some may just need a little bit more time to be noticed. Matt and I spent quite a bit of time trying to figure out how we wanted to contribute to the discussion of theme. We hope we raised some interesting questions in the minds of designers about how to develop theme in games. We had the easy part, now it is up to you to execute. Tbh, while not wanting to detract from the interesting subject matter and the good examples etc that the author discusses, the “modified style” reads as poorly edited and a bit incoherent. What are these two sentences: “It is fitting for a narrative of the books to emerge determine a winner. Thematic subtleties like these can make the entire experience when they show up at a table full of angry players to to send their regards.” supposed to mean? Thanks Mo! I appreciate that you point this out. Somewhere between posting it and now I accidentally reverted it back to an older draft which was a WIP. I’ve now corrected it – I apologize for the unnecessary confusion. Hopefully it is a bit more clear for everyone in this final version. It still may come across as strange but it is worded to reference major events in the story line of Game of Thrones (ASoIaF). Love the subtleties in this article. Its got a sort of wacky brilliance to it. Keep it up! Thanks Alfie! I’m glad you enjoyed it.